Those that have been in the lighting business a long time can probably remember the struggle of energy efficient lighting: The product came into the market higher priced than their older cousins, the fluorescent light bulb. They were too bright. Too white. What was the benefit? The benefit, it turned out, was energy savings. Lots and lots of energy savings. (Some would say the aesthetics have since caught up to this benefit as well.) However, since the habit was to change out light bulbs once the old ones aged and burned out, the lighting retrofit took a while to gain traction. We now find ourselves in the same situation with a new product package in the commercial market: the humble motor, fan, and VFD packaged retrofit for HVAC and refrigeration. HVAC takes up to 30-50% of your utility bills according to the US Department of Energy and field experts — and the vast majority of commercial properties are wasting money on inefficient equipment. This is due to manufacturers cutting costs with the original cheaper components to boost margin. One of these main components is the motor that drives the air flow in forced air systems. There has been a new kid in town for quite some time, but it remains virtually unknown to those in the energy efficiency business: electronically commutated motors (ECM). These motors are 70% more efficient than their older cousins, the shaded pole motor. This technology has been around for decades, but has remained virtually unused since it hasn’t been mandated by code. The mandate for brand new equipment is about to change from the DOE this June for brand new installs, but this still leaves almost 90% – including relatively new systems – in HVAC and refrigeration installed with these old motors that burn through your utility dollars much like the old incandescent light bulbs. Most people upgrade their equipment when it breaks down, just like businesses waited until their light bulbs burned out in the old days. This thinking is short sighted, especially when you see how much impact on energy use a new motor retrofit can have on your bottom line. A Kansas City based company – FridgeWize – is out to change minds and bring awareness to this opportunity in the commercial market. They are uniquely positioned in that they are the only company in the U.S. with a business model to retrofit high efficiency ECM’s to end-user businesses and property owners nationwide. Founded in 2010, they have already done retrofits nationwide in major chain restaurants. One such nationwide retrofit saved over 5-million kilowatt hours (kWh) over 450 restaurant locations – that is the equivalent of a 2 megawatt solar field (at almost five times less the cost of renewable installs). For energy wonks, the numbers are fun to see. 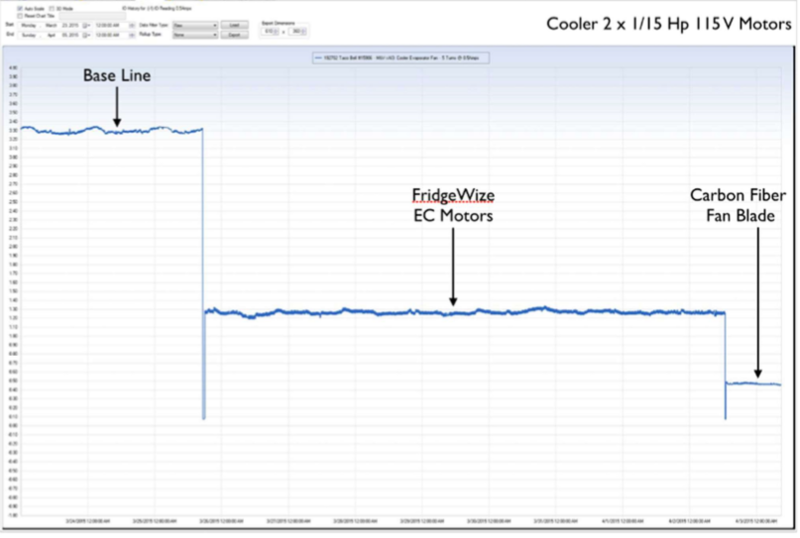 In refrigeration, FridgeWize consistently sees 80-90% energy savings when retrofitting an old shaded pole motor with an ECM and their own carbon fiber blade where they have a patent pending (see Image 1) on the walk-in cooling units. Image 1. Testing measurement of energy pull via amps from old motor (Base Line) to new ECM and carbon fiber blade for walk-in storage refrigeration. In more traditional HVAC air delivery – such as roof top units, air handlers and VAV fan boxes – the kWh savings are not as aggressive, but still better than any other more common retrofits in the industry; and roughly 10% the cost of replacing an entire HVAC system. 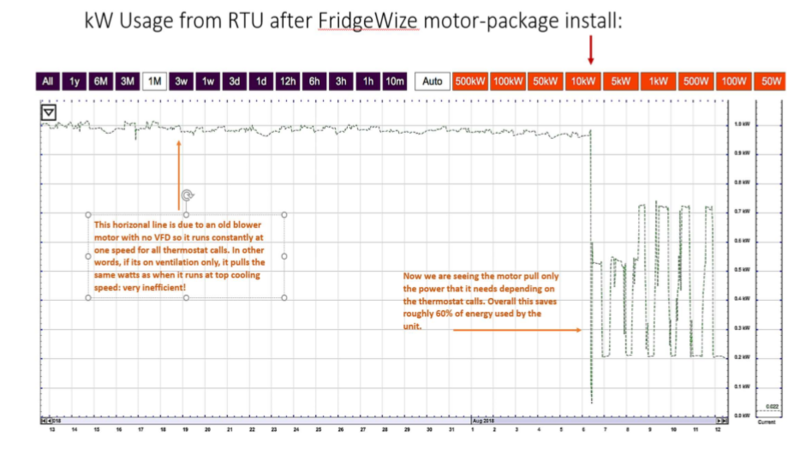 FridgeWize in several case studies has seen roughly 60% reduction in kWh’s on the power needed to operate the blower fans when using ECM’s along with a variable speed drive (VFD). This is illustrated in Image 2. Image 2. Before and After an ECM plus VFD and smart card install on a roof top unit at a large manufacturing facility in the Kansas City area. FridgeWize has seen validation in the last several years through international awards won in the industry. In 2016 they won the illustrious Energy Efficient Product of the Year for HVAC&R. The firm’s CEO, Ryan Grobler, was presented the award in London after beating out high profile products from the likes of Mitsubishi and Samsung manufacturers. The rebates Grobler mentioned are the 75% HVAC bonus rebate being offered by KCP&L through September of this year, or when the money runs out – whichever comes first. For more information on FridgeWize and their retrofit products, they can be reached at 913-579-8484 or info@fridgewize.com.